According to the Conference Board of Canada, the financial services sector employs more than 800,000 people and accounts for 7.2% of the Canadian GDP. As this industry continues to grow, so too does its need for highly-qualified professionals who have the training required to compete in a fully-integrated financial ecosystem. This is where the Lazaridis Master of Finance program sees itself excelling. After four years of continuous growth, the fifth Lazaridis MFin program in Toronto is getting ready to welcome its largest cohort of students in an effort to meet the growing needs of the finance industry’s labour market. The success of Canada’s finance industry relies on a steady stream of qualified, educated professionals with a comprehensive understanding of financial products and tools. Small and medium enterprises (SMEs) make up 99.7 per cent of all businesses in Canada and they often rely on financial institutions to provide additional services beyond core banking and insurance functions to help them expand their markets, reduce volatility, manage costs and reduce risks. Five years ago, the Lazaridis School saw the increasing need for financial expertise in Canada and took advantage of that opportunity by offering a stand-alone MFin degree in Waterloo and Toronto. “After seeing the incredible response to the Waterloo-based MFin program over the last decade, offering the MFin program in Toronto made complete sense to us because that is where the heart of the Canadian financial sector beats,” says Program Director, Tony Tang. 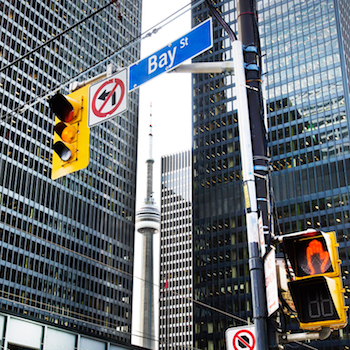 Not only is Toronto the largest financial centre in Canada, it is globally recognized as a financial hub and has been named the second most important financial centre in North America. Over the years, students have been drawn to the Lazaridis MFin program for a number of reasons, both personal and professional. Current student, Wendy Onuoha was attracted to the one-and-a-half-year program by the opportunities that come from such a highly-sought after degree. But the benefits of the Lazaridis MFin program go far beyond being able to tap into the world of high finance. As Tang explains, the real value of the program is the experience of earning the degree from a program that puts students first. Applications for the September 2019 cohort are currently open. To learn more about the Lazaridis MFin program, contact Program Coordinator, Chau Truong-Wood at mfin@wlu.ca.